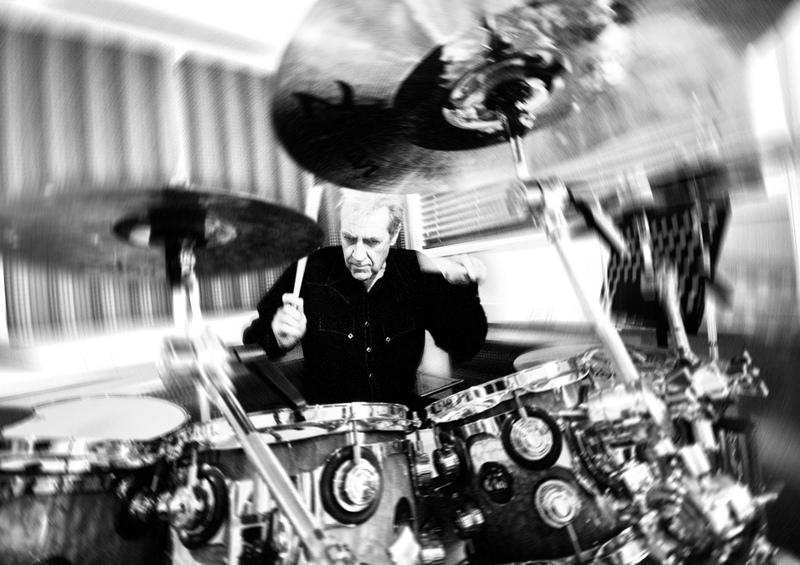 What’s exciting and endlessly fascinating about recording drums (and the same is true for when you’re listening to music too, I think, although when I began placing microphones I became consciously aware of all the practical implications of something I’d previously understood unconsciously) is that every drummer in the world – every single one – is different. Give them the same boom-boom-bap drum pattern to play and the same tempo to play it at, and every drummer will be different. Different feels, different internal balance between the kick, snare and hi-hat. Some will feel almost metronically perfect. Others will get on top of the beat and look to push the excitement by playing the snare right on the very front of the beat. Some will lay back, adding a don’t-hurry-me swing. Hopefully these three wildly different drum tracks will demonstrate this (listen to the first 30 seconds of #4, then switch to #5 – you should really hear what I’m talking about! John ‘JR’ Robinsons’ drums on Rock With You are almost superhumanly tight, but they’re not rigid. It feels great. You could never listen to this song and assume that the rhythm track was programmed – it’s too playful. Two and four on the snare, 16th notes in the intro and choruses, 8th notes in the verse, displaced quarters in the pre-chorus (by which I mean he plays the ‘and’, as in one-And-two-And-three-And-four-And), endless little ‘pssts’ and emphases – he’s having a ball. Good transient response is especially important when recording acoustic instruments. This is one case where it’s extremely important for one to have equipment that is able to capture as much of the initial transient as possible, and all its accompanying delicate details. In the music that I am normally involved in, I have always felt that good transient content is one of the very most important components of the recorded image. I would even go so far as to say that transient response has at its core a direct relationship to the emotional impact of a recording. Particularly in the main genres of music that I record…. namely R&B and pop recordings. The faithful recording and reproduction of sound source transients makes the strong rhythmic elements in R&B and pop recordings much more dramatic. These are the elements that are so important, such as the ‘kick’ or bass drum, the snare drum, hand-claps, percussion… etc. I think that well recorded transients give R & B and ‘Pop’ recordings a feeling of tremendous energy. To me, the excessive use of compression and limiting diminish the drama of sound source transients in recorded music. Back to JR. As well as being the creator of some of the most danceable drum tracks in this history of popular music (Rock With You, Don’t Stop Till You Get Enough, The Way You Make Me Feel, Give Me the Night), his opening snare fill on Rock With You is one of the all-time fills. Stewart Copeland is a famously ‘busy’ drummer, so it’s not a surprise that his simplest part may be also his most underrated. But it perhaps also allows us a little look at what makes him tick as a player. Copeland’s tricky hi-hat fills in songs like Walking on the Moon showed a player who liked to fill space, but the choruses to songs like Roxanne revealed the power and energy he had in the tank when he chose to use it (listen to the outro when Copeland plays a double-time backbeat alternating between the snare and toms – he’s clearly giving the toms what for). So Copeland’s playing had an oafish streak to it, at odds with his reputation as a progger and reggae fan. But there’s another factor in his drum part to Every Breath You Take: his frustration at Sting’s insistence that he play a very simple kick and snare part with no hi-hat in the verse, and no fills. This tension boiled over frequently in the studio and soon enough would end the band. But in terms of this recording, we ended up with a drum track in which Copeland strains at the leash all the way through. He’s right on top of the beat, almost to the point of being early. He’s this barely contained energy animating the whole song. Again, the indispensability of Copeland’s contribution is confirmed by listening to any of the godawful cheesy versions Sting has done live since the Police split up. Every time I hear this song on the radio I’m tickled by just how lazy the drum track feels. I don’t mean that the drummer can’t be bothered; I mean that the drummer couldn’t be any more at the back of the beat without the song grinding to a halt. There’s no doubt that this effect is intended. The lazy swagger of the song is the whole point. The drummer wisely keeps the fills to the minimum, concentrating on placement of the backbeat at the very back end of the beat, but his sudden, frantic 7-stroke triplet drum roll at the end of the last verse, under the song’s key line ‘So what if right now everything’s wrong?’, is a great addition. According to Discogs, the drummer was Michael Urbano. Jim Keltner and Pete Thomas (the Attractions) also play on the parent album, and as much as I love those two guys (Pete Thomas on Elvis Costello’s Sulky Girl is one of my favourite drum performances ever), I can’t imagine even those all-time greats playing the song better than Urbano did. This entry was posted in Music and tagged Andy Summers, Bruce Swedien, drummers who can drum/singers who can sing, Elvis Costello, Every Breath You Take, Gearslutz, Hugh Padgham, If It Makes You Happy, Jim Keltner, John JR Robinson, Michael Jackson, Michael Urbano, Off The Wall, Pete Thomas, Quincy Jones, Rock With You, Sheryl Crow, Stewart Copeland, Sting, Sulky Girl, Synchronicity, The Attractions, The Police on November 3, 2013 by rossjpalmer.